My second tutorial cover the steps necessary to bring a black and white artwork to the world of colors. Note : I let you the care to save your document often during the process as on the part 1 . I advice the 'Krita document' ( *.kra ) files , but this time , why not using a different saving option? a feature in the menu "File > Save incremental version" is useful to keep track of your 'work in progress' steps. Press it, and check on your disk what this feature does. Note 2: As usual, click on the pictures to enlarge them. 1. Open your artwork done on the first part. 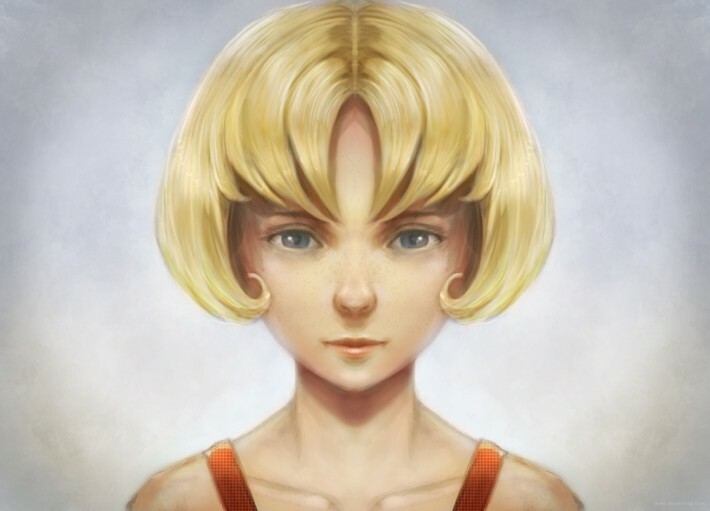 Set your zoom to 50% and center the artwork into your viewport. Don't forget to activate the mirror mode in the top toolbar. 2. Flatten all your layers Ctrl+Shift+E or in menu Layer > Flatten Image , name the result 'b&w' . Duplicate your 'b&w' layer, name it 'colorbase' and call the Hue/Saturation/Windows color filter by pressing Ctrl+U. Check the 'Colorize' box. 4. 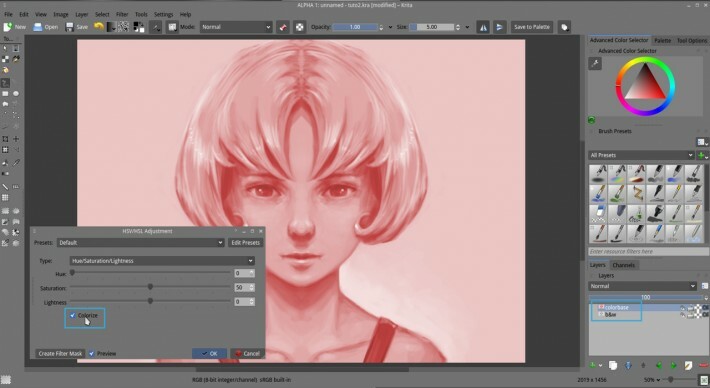 Create a new 'paint layer' above, named 'color' with the blending mode HSY > Color . Take the 'Airbrush_pressure' brush preset. Do a first pass of tinting area of your artwork with pure colors and test around. Fun , right ? on a 'HSY color' blending mode layer, all the stroke affect only the Hue and saturation , not the value. So you can keep your value and paint color without destroying them. 5. Keep painting. Note : the color picker ( hold Control key plus click ) works fine on a Color type of layer , you can use it. Adjust when necessary by removing the color with 'E' the 'eraser mode' to reveal the base color underneath or enrich the range of colors in your artwork by using hue from the Advanced Color Selector. I often restrict myself to unsaturated tones because it's easier to saturate or enrich later. You can see on the screenshot my 'layer preview' ( a dialog who appear on the bottom right, it will appear also for you if you keep stylus over the layer name ). This preview will give you an idea of the painting work I do on it. 6. 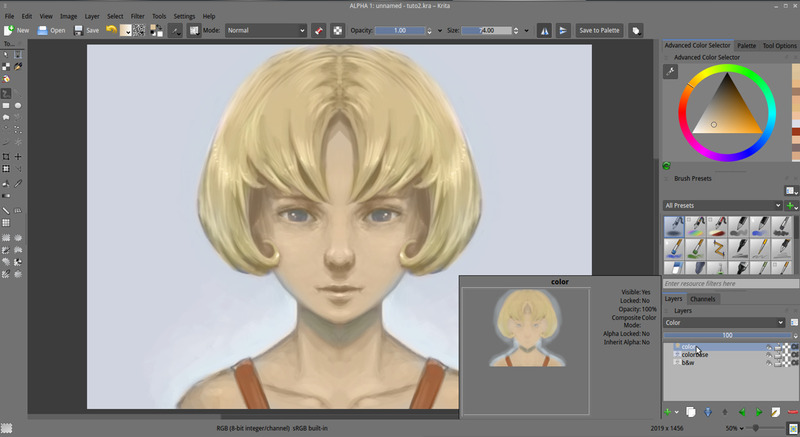 Create a new paint layer named 'glaze' and with the blending mode Arithmetic > 'multiply'. We will do now an almost similar pass than a traditional glazing with oil painting . Take again the "Airbrush_pressure" brush preset with mid opacity and glaze the colors, add red in the shade of the skin to flesh the model , make deeper the zone where the skin doesn't reflect light , and let see more the blood color under the skin. Crease also some deeper shade for the hair. Glaze the eyes as if you would perform a make-up on them. Resize your brush if necessary to perform more little details. I don't advice to zoom in. Glaze also the lips as if you were applying lipstick on them. Remember glazing will darken only the colors and so it's important to keep doing it steps by steps, low opacity strokes by low opacity strokes. Glaze the overall artwork till you reach a good aspect ; this include hairs, backgrounds, etc... ( Note : Glazing steps is good to add stain, tatoo, patterns but to keep this tutorial clean and generic, I'll keep my basic character ). 7. 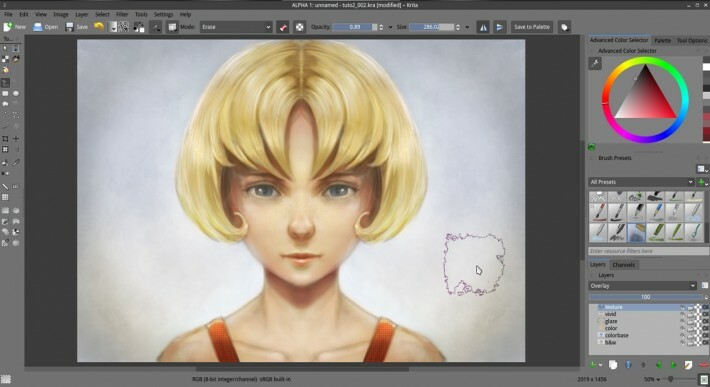 Create a new paint layer named 'vivid' and use the blending mode Mix > 'overlay' on it. With a dark airbrush at low opacity , vivid the shadows. It should increase the contrast in those areas, unify the local tones and add saturation. Do the same with a bright color to brighten zone and so, increase the intensity of the lighting. With white , do little and subtle corona of light around your higher values ; such as reflection on the lips, and on the eyes. 8. Create a new paint layer named 'texture' and use the blending mode Mix > 'overlay' on it also. With a dark grey and a variety of preset who do textures on the canvas as the 'Splat_texture2' or 'Sponge_texture' in the default brushes, we will add a soft texture to part of our artwork. For example, a bit of grain to the skin. Be subtle , the effect should not 'jump' into the eyes, but be a secondary thin effect. If your effect is too strong , erase it. The colorization setting for our artworks is now done. The goal was to 'sketch' the colors of our artwork. Also, I kept the color choice simple on my example even if it's a bit boring and generic. But i think a tutorial example has to be generic to be enough open to any interpretation. The important is now about what you can do with it. Feel free to test make-up ; tatoo , blue skin , reptilian skin , colored hair , etc... etc.... more material , more lighting situation. There is an endless way to digitally colorize a black and white artwork. Here is just a 'cooking' proposition on how those three pass of layer blending mode 'color' / 'multiply' / 'overlay' can work together. They work better if you kept your black and white value bright as we did on the previous tutorial. If you practice them, they become predictable. I hope this visit inside the interface of the powerful options of Krita made you discover new aspect of this software. Options you probably ignored before. Repeat it again till you'll feel more confident with the steps to replicate without this page and express your color tastes with this tool and method. Next part ( to be published ) we will learn the way to push the rendering to a higher definition and correct bugs. Our picture has many issue now , and don't offer many details. By the way, those issues and bugs can have a charm. A 'speed-painting' charm. License: CC-BY David Revoy, www.davidrevoy.com, 4 september 2013 . Hell, thats awesome! I knewed about layers blending modes but didn't knew how they work and never studied this question by some reason. But this article ^^ open my eyes. I'm so impressed doing this kind by myself. And now i realised that coloring with help of layers blending modes muc easier and faster, I'd even say a hundried times faster and easier. At least for me)) Thx, David, for this article! Une question : il y a visiblement la possibilité de choisir la langue de l'interface. Sais tu où on peut télécharger les fichiers de langue ? merci par avance. merci! Oui. 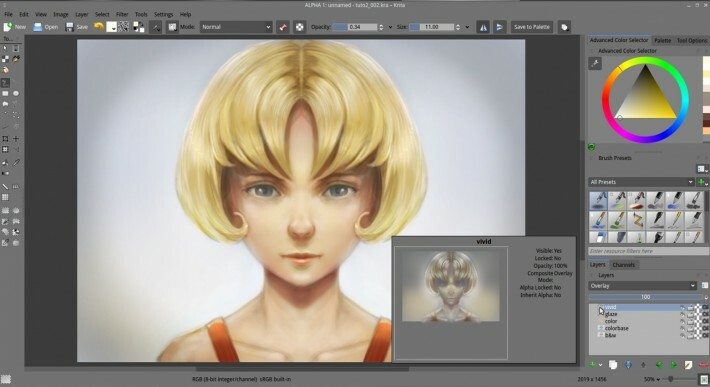 Pour Windows les dev continuent d amener des modifications car Krita n y est pas stable contrairement a sur Linux. Donc 2.8 et alpha pour dire en cours. Au sujet de la langue, j ignore windows. 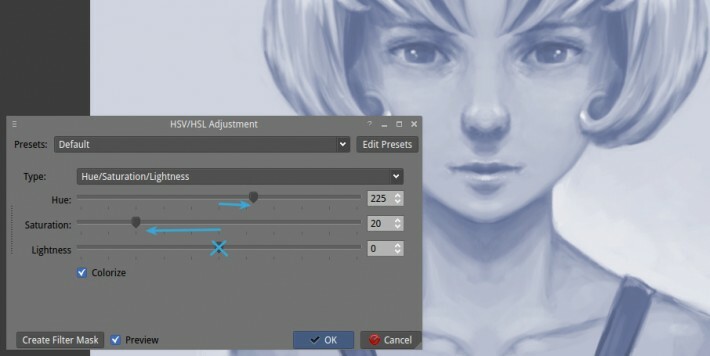 Sous Linux Krita suit la langue systeme et est traduit a 100% en fr. @todor @kot-barbos @Mr. Anon : Thanks! Awesome, cannot wait for the next part. Very good tutorial. A simple question: starting from a Black and White drawing is your usual main process to get your final illustration ..or not? I usually start with a simple sketch and then I immediately color and adjust it until I get the final work. @Stramaz : Thanks ! Yes, I often start with black&white sketch and I'm a kind of drawer who can't really keep it 'line art' or black and white ; even with a pen I need to crosshatch some value. I think I really like working values. Coloring immediately also happen ( more and more ) but I'm still not enough skilled to can manage right value and hue at the same time. My brain often need to split this into two pass. I don't understand. When I use HSY → Color blend mode, my colors are much brighter than the ones I chose in the Advanced Color Picker. I think I understand now, you need to have the value already set in the black and white image when you reach this part. Nice tutorial, but when I'm coloring like this, white becomes blue and black becomes light grey. This confuses me immensely, for example what if i'd want to make a dark haired character but haven't got any black? @Cestarian : Thx ! for your color invading your whites and blacks ; just paint them with white/or/grey/or/black with a 'color' layer. You can also increase the black value and the white in the 'vivid' pass by painting white or black. Thanks for your reply, but the problem is occurring when I use the 'color' layer. The darkest color (black) is Light Grey if I use the color layer, but it's perfectly fine black on any other layer. But I'll go with your suggestion to increase the darkness in the vivid pass. Worst case scenario I'll end up with a grey haired character, practice is practice after all. - Overlay ... this part is not in oil painting , but I use it just to reinforce the local contrast and boost/vivid colors. One thing I always have problems with though is selecting the colors for the skin, and sometimes the hair can be a bit tricky too. 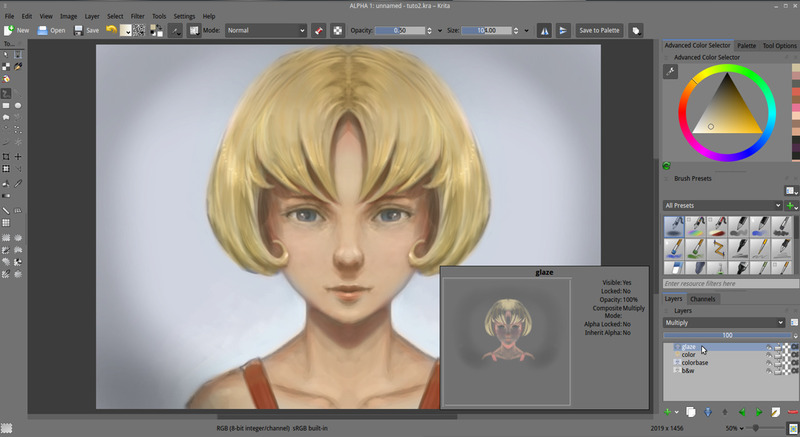 When it comes to the skin, in this tutorial I tried to find my own skin color which turned out questionably well, but before when I drew some portraits as an exercise, I found a random picture from my wallpapers folder which had a skin-tone that I liked and picked out the skin color, then copied it to my painting program. Do you have any tips or know about convenient tutorials about that? You seem to be really good at it. @Cestarian : Thanks for your comments about my skin tones. I'm constantly working on it; and when I see work of masters ; I feel I still have to study a lot. As far as I understand it ; it's important to approach skin not as a surface , but as a 'full' material. Bones, blood, skin thickness, nerves ; all of this impact on the final color selected for the skin. Mixing this with shading of the scene, and tones of the ambiant ; and it's probably one of the most difficult material to render. A good start to learn 2D material rules is on this tutorial : http://androidarts.com/art_tut.htm , one of my favorite tutorial. I'll be keeping an eye out for your stuff of course, and you may see more of my comments around here and there. When I'm starting to think that I'm getting pretty decent at art, I'll make sure to let you know as one of the people that helped me (directly even) to get there. That one was nice and short, I learned a few things about how to work with lighting. Highlighting in particular from that one. I feel that I can probably learn more from it later though when I've learned more than I have now. Luckily I write down all the tutorials I go through in my DA journals so I can dig them up later to re-visit. I should keep them in a single list though. @Cestarian : Nice you keep a journal of it. It's really precious , I'm curious what type of tutorial is the more useful when starting. Well, I guess since I'm a beginner that makes me ideal to ask, but since I haven't learned all too much yet it may be a bit too soon to ask. What kind of tutorial is ideal depends most importantly on what the artist wants to do, but secondly on what category he falls into. I guess there are many more subcategories to each, but for example if someone wants to be good at drawing objects (like trees, spheres, tables) he falls under environments. Most artists will want to do all 3, but they have to start at just one of those, the one that's most important to me. For me out of what I listed I'm artist category 3 and focus category 1. This tutorial was useful to me, but I feel that due to the lack of explanation it's both hard for me to follow and for less patient newcomers, it could even be impossible to follow. However that is fine because this tutorial (I assume) was aimed at intermediate artists rather than novices. However for an example of the areas where I failed, My version of the picture looks like an asian adult woman rather than a young european girl, the hair is a gooey mess, the shading looks hideous, the lips are not pretty and I haven't finished the coloring part (face looks like clay) deciding that I'll return to this tutorial later when I'm more used to the tablet. My picture looks downright creepy, but I learned a lot from you about drawing realistic looking eyeballs. However, since the eyeballs are the only thing in the image that looks good, the rest looks downright creepy. I don't comment much on them though, except the ones I've figured out by now were particularly useless. Let me count up here which ones of the ones that are in the seen list at this moment (up to 20) I find the most golden. Yeah, there's just a lot to art. Lot of content to cover, and it would probably take years for one person to cover it all. But when it comes down to it, I think the very best tutorials come from skilled artists teaching everything they know in detail about the thing they think they're best at and enjoy doing the most. So when making a tutorial you could just pick an area that you yourself think you excel in (no one would know better than you yourself what you excel at), think about it real heard and break it down into details, then make a tutorial explaining these details as well as possible in as few words as possible, but the really hard part about making a good tutorial is while still using few words; make it easy to follow for a novice. This here tutorial is hard for a novice to follow, could be impossible. for some. Calibrating the stylus tutorial is perfect for a novice to follow (you even go into details) tutorials that don't require great skill. If you want to apply some video-game logic to making a good tutorial, watch this. I'm sorry; I'm going into more detail. If you want to cover advanced topics in tutorials (like right here, coloring + shading is pretty advanced, perspective is advanced too) it's a good idea to make a series of tutorials starting at something so easy a child could do it, that eventually leads to an advanced technique. Like shading with colors rather than b&w transparent brushes level of advanced technique. There's a lot more to say, but I'll lay off, you get the picture or at least what to think about when making a tutorial by now. The most useful tutorials for a beginner are the ones that teach the barebone basic fundamentals of things (absolute novice level stuff), like drawing simple shapes, applying colors to lineart, how to hold a stylus, making a light source and determining where it hits, applying shading to the image after that, the most basic techniques out there (like drawing a "crosshair" and turning it into a head, or shaping the hips of a female) it's the tutorials that teach you how to actually draw (assuming the most you can do at the start is read and write), concepts and how to make use of these concepts/applying them to your images (like shading or coloring techniques, perspective, proportion, etc) however, to make those tutorials interesting it's important to wave a carrot into the readers face. For example if you're a skilled artist (You are.) you can flash a nice picture you made and say "this is one of my pictures, and I would like to teach you about this technique and that concept" or like the "how to draw" guy did (in video 3 I think) teach super basic stuff, and then draw something cool with only the things he's taught so far, however my opinion, that one is a bit late showing off what this tutorial will teach you how to do (this here tutorial does it well, flashing the finished image into the readers face on the first page), but better late than never. @Cestarian : Hey, Thanks for the long break-up ! You really spent time on it, and your links and documentations are a really clean feedback, giving me a better idea of some basics skill I never covered in my drawing/tutorial arts. All of this will help me to improve my next tutorials. I really liked "More action, less text" , "Start at as low/easy a level as possible" ; I really think my tutorial collection is still missing this sort of essential skill ; a sort of big first 'to-do' , or from-scrash. 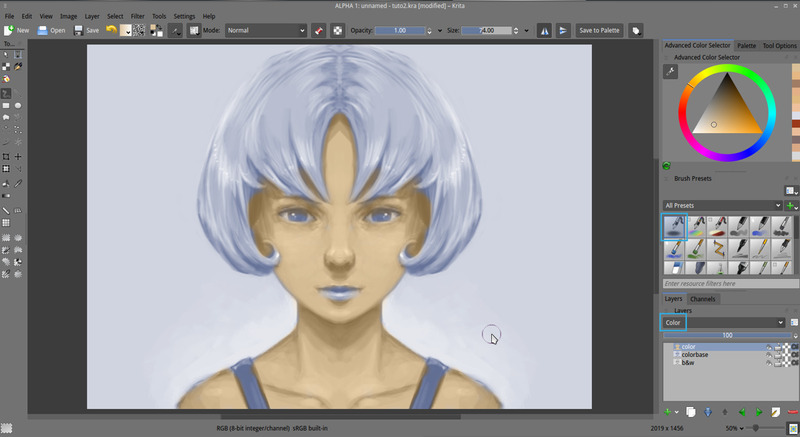 Also, I realize my " Getting started with Krita" is targeted to user not really beginner with drawing. So, I'll think about it, it might take me time to do ( I'm working right now on a movie , plus I'm learning & training for new drawing technics because my taste had evolved with time but my technic not really ). Just remember to place the carrots too! Thanks so much for this tutorial, David! I am new to digital art, and was overwhelmed by Krita, but really wanted to use it, and now I can. Additionally, you taught me art techniques that I have never come across, since I draw for the fun of it, and haven't trained in school or professionally. What a bonus! The b&w/color layer techniques will be great to experiment with, since I've found myself drawing then coloring, becoming dissatisfied with the color and losing the drawing a bit without being able to recreate it to my satisfaction. This will save the drawing (from me! hehehe), and will give me room to play with colors. Thank you for the time and effort you put into this. It's a gem and your picture is very pretty already:) Looking forward to Part 3! @Lizzy : Many thanks for your very positive feedback ; it encourages me a lot to continue to publish free tutorials. @Couchpotatoe : sorry to hear about this. This tutorial was done years ago on 2.7 , 2.9 is different. If you follow the steps and the screenshot from part 1 , then part 2 it should help. Wow!! Great idea. It's very hopeful. I appreciate your work. Thanks for sharing. Hey David , your artist style is very perfect. Thanks for sharinh such nice art tutorial with us. Hi, I really like this artistic tutorial series. But it seems the link to 3rd part isn't working. can you see to it? Hi David.Thanks a lot for this great tutorial.I've learned a lot and it's made me feel much more confident about digital painting. But I have a little problem.When I work on the 'color' layer above the 'colorbase' one,I select a hue but when I paint it over it's much lighter than what I chose.This happens with all brushes,not just with the Airbrush.I checked for any mistakes in my blending modes or layer order but everything is just as you explained.In the layer preview the hue is right but it seems like the problem is in the way the layers interact.If you know what the problem is, please tell me. Thank you! EDIT: Apparently this happens when I use darker hues since when I used lighter ones (light skin,blond hair) it seems to work fine. @PR : Hi! The 'Color' blending mode only affect the Saturation and Chroma ; not the Luminance of the picture. So the brightness of your color pass depends only if the value of grey ( Luminance ) was setup more or less right. Maybe your grey pass was too bright? oh, I just read now your second message. Yes about dark colors: they contain a lot of grey/black and this one just make colors a bit greyish and not too saturated. The 'ctrl+U' doesn't work to bring up the hue saturation window. How do we get that window to pop up? Oh, it sounds like a bug , or custom shortcut layout. > 'HSY color' blending mode layer, all the stroke affect only the Hue and saturation , not the value. So you can keep your value and paint color without destroying them. This part right here is actually very unclear. Since in 3.0. our new paint colors are not blending with the colorize layer. As a result, many readers may be stuck by this tutorial depending on how well they know their way around the software, and/or if they're looking for different techniques to improve their work such as I. Hey yeah I did. After playing around with it and watching your recent tutorial I was able to find what you spoke of...the recent tutorial you made this year was beneficial. Other wise, I would have been lost. =D This goes for my other comment as well. Thank you. Another thing I noticed is that when using 'color', if we create a new paint layer, the colors won't blend with the previous layer. So we have to remain on the same layer to do 'color' and 'over lay' with the new 3.0 Krita. Oh, this is a very big bug. I didn't knew this one, it never happened on my Linux install since I started to use Krita 6 years ago. Do you have a youtube tutorial on this....I think I'll do better with a video instead of reading. hey david...this is an amazing tutorial...i am beginner to digital painting,,so i couldn't figure out some basic problems .whenever i saw your tutorial on your blog and on youtube i always see whenever you fill any color it makes very precisely outlined object.for example when you paint the hair it is only for background but when i paint it also painted some portion of background.i know this is an absurd question but i just want to know....and thanks for your tut. The secret is just to keep things on separate layer ; so the line keep in foreground , and color in background. Hi, I'm at step 4 of part 2 when you create a paint layer to start using the airbrush pressure tool. Well, I was wondering why I can't use white because it turns the affected areas gray? Same thing for black, the picture I was working on needs white, but it shows up as gray on the color layer yet on the preview I can see the white color. Please help. Thank you for your tutorial and the time you spend with greenhorns like me :) The subtle tone, great detail and the mood in your art really is encouraging to practise digital skills! I am about to finish the second part of your tutorial and noticed (no surprise) some problems. 1. The hair detail - at the end of your job I can see them clearly - on my attempt there's a helmet instead of hair? Which step of the job I need to improve? 2. Blurred picture - I used wide strokes (esp. for the hair), so is it a matter of narrow strokes to make it sharp or something else? If you can help, it would be great. merci enormement pour votre tuto! j'ai encore beaucoup a amelioré mais je suis deja mieux qu'hier et c'est TRES motivant! ...j'aurais bien aimé partager mon petit travail mais je ne vois pas comment transfomer mon image en URL je ne m'y connais pas vraiment en ordinateur! Continue d'inspirer les autres et tes dessins tout simplement genial! Alors alors, me revoilà face à un autre problème. Comme vous voyez, les couleurs que j'applique ont très peu de contraste et sont extrêmement pâles ... Ce qui fait que j'ai abandonner l'idée de colorer les cheveux en noir (ou quelconque couleurs plus foncé que blond). Je n'arrive pas à donner un aspect de rouge plus foncé pour la robe aussi. Bref, avec cette méthode de faire tout en noir et blanc pour ajouter la couleur, il semblerait qu'utiliser le noir et le blanc ou quoi que se soit de trop foncé ou de trop clair est hors de question et impossible. Comment puis-je faire face à ce problème? Bonjour, tout d'abord, merci pour ce tutoriel, je viens de télécharger krita et ça m'aide beaucoup :D! mais il y a quelque chose qui me pose des problèmes, quand je passe un calque en mode HSY---> Color et que j'utilise du noir ou du blanc, je vois apparaître du bleu à la place! je ne sais pas trop quel est le problème ou si quelqu'un l'a déjà posé, mais j'espère obtenir de l'aide! Just wanted to say thank you for this tutorial series! I got stuck somewhere in the first part trying to fix the shadows and highlights, it's too hard for me too 3d model? (not sure it's the right term). Anyway, continued here just to try how the coloring process goes and just continued with what I had and basically just had fun adding splat textures. Here's my result https://drive.google.com/file/d/0B5WIUSqAYQgMZ0pvVXJYbU9UbVU/view. Thanks! Hey ! Thanks for sharing your result and a nice word about the tutorial. Yes, the part with modeling in black&white always need practise to get used and find a predictible result with colors. It's often a common trap to not contrast too much this step, or leave too much white , black ; or group all values of grey in the center ( 50% grey ). One key for good contrast, is to setup a "bed" for the illustration in low or high grey ; and choose an accent in the opposite direction. (eg. bright focus point on a overall dark grey artwork ). All my encouragements to continue and experiment ! I have a tutorial in my notes, never published about "values". It's probably time soon to rewrite it and make a blog post with the notes. The best book I saw talking about it were the "Color and Light" of James Gurney. Also, about this type of workflow check http://www.androidblues.com/JealousyStepbystep/jealousystep.html ; it's an old tutorial ; probably published before 2004. It's were I learnt this type of grey to color technique. I'm just not getting it, at....step 5 or 6. I get stuck with a skin tone way too dark.